"Return to magic. Return to hope. Return to Narnia." Three years after the Prince Caspian episode, Edmund and Lucy are visiting their annoying cousin Eustace Scrubb. When the children are looking at a painting of a ship, they are transported to the ocean in Narnia. The Dawn Treader recues them. Caspian is at the helm, and his uncle, Miraz, has banished the seven Lords of Narnia to the Lone Islands. The island is a slave auction site. In the process of trying to rescue the Lords, Caspian and Edmund are captured, and Lucy and Eustace are sold into slavery. The slaves are really sacrificed into a green mist. The Dawn Treader rescues them, and the new governor gives Caspian a sword he received from Asian. Lucy enters a manor belonging to Coriakin, a magician. She is forced by the Dufflepuds, to seek out a spell for visibility. The swords of the seven lords are the key to defeating the mist. Once the swords are laid on Asian's Table the mist will be gone. Lucy transforms into Susan due to a beauty spell. Her dream reveals that neither Narnia nor Lucy exist. Lucy is reminded that her family only believes in Narnia because of her. Swords are recovered as the children face dangerous obstacles. Eustace transforms into a dragon because he stole from the dragon hoard. All but one sword is recovered when the crew arrives at Asian's Table. Lilliandil comes forward, and guides them to the last Lord. Eustace becomes a sea serpent, and is hurt by the last sword. Asian transforms him back, and Eustace is sent back to Ramandu's Island with the last sword. The mist appears as the White Witch, in order to distract them. Eustace is able to place the final sword on the table. The mist dissipates. The slaves are set free when Edmund kills the sea serpent. The children are returned home never to return again for they are grown. They enter the bedroom through the portal and hear Eustace's mother calling them. 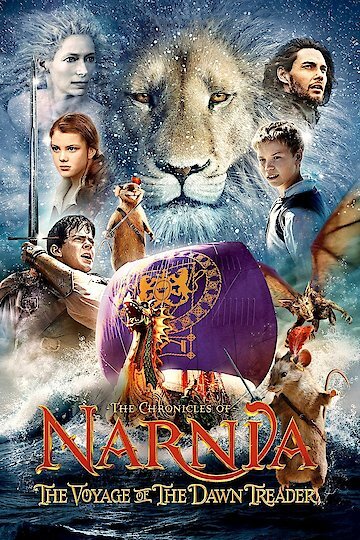 The Chronicles of Narnia: The Voyage of the Dawn Treader is currently available to watch and stream, buy on demand at Amazon, Vudu, Google Play, FandangoNow, iTunes, YouTube VOD online.